After my slightly disappointing feedback on part 5 I have decided to try a couple of ideas that I had initially put to the back of my mind and haven’t tried yet. A project like this could (and probably will) go on forever with different ideas appearing all the time so I did try to limit myself so I would have an end to it for the purpose of this course. It was never going to be (in my mind) a final piece as such as I am hoping to carry on developing these ideas in my artistic practice. 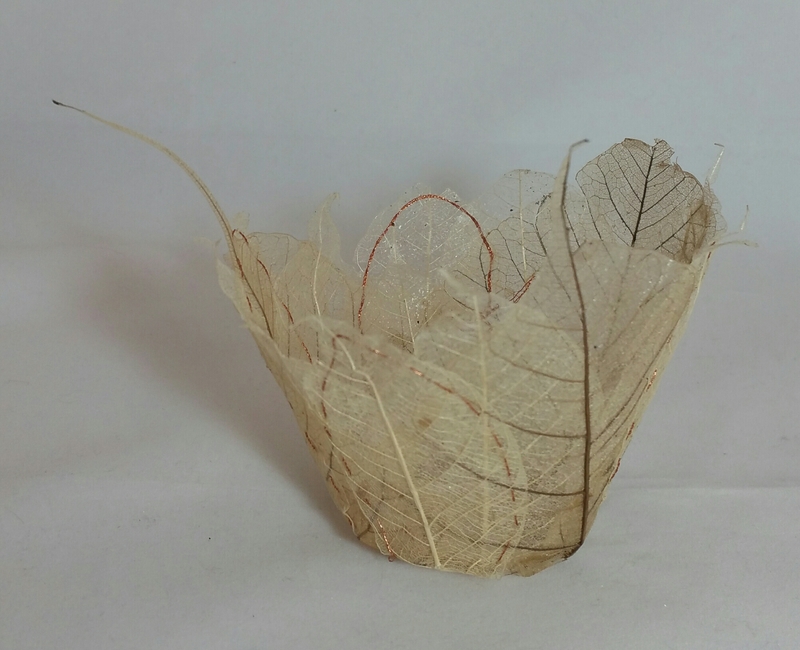 Re-colouring the existing structures to make them appear more natural (I had discounted this option early on as I preferred the simplicity and purity of the un-dyed leaves based on Kay Sekimachi’s leaf bowls, but it may make them more interesting colour-wise. 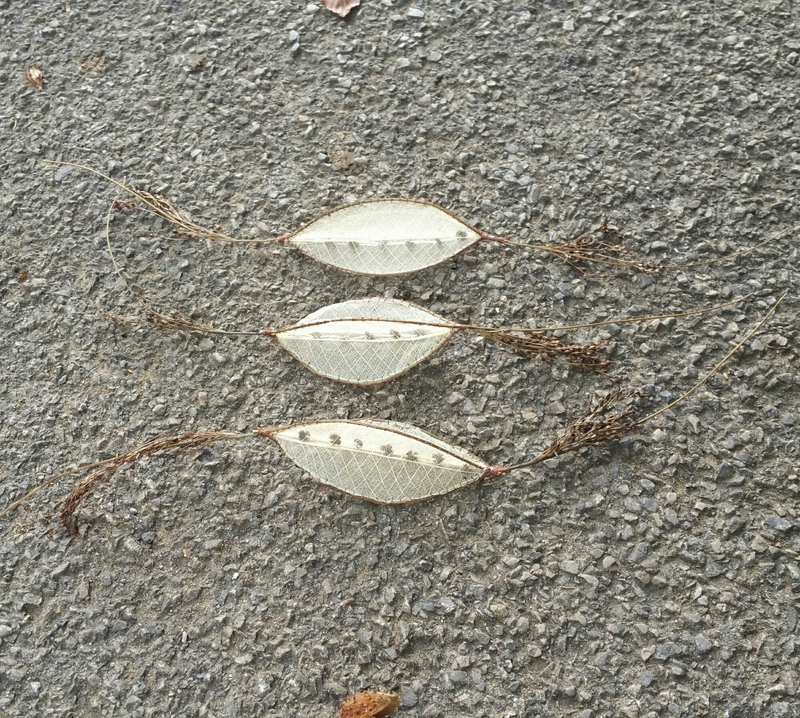 To make the same three sided form from real leaves that I find on the ground. Obviously there would be nothing inside as you would bot be able to see through, this time it would be more about colour and texture rather than structure. Once the ‘pods’ are made they could be wrapped in the same re-cycled fabric yarn that I used for the wrapped bark samples. 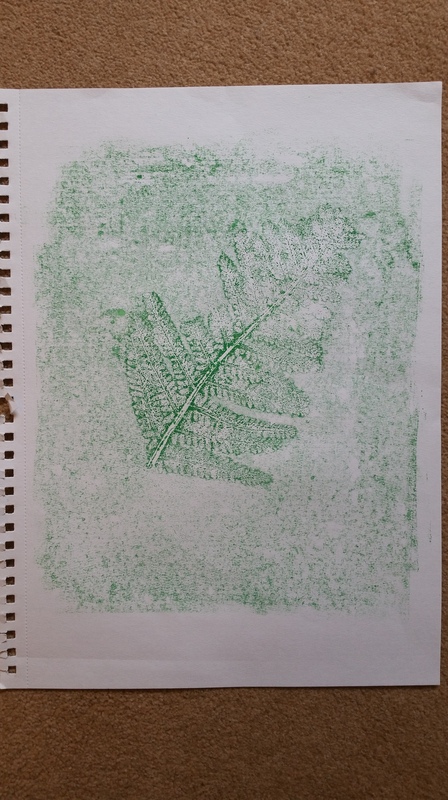 I am hesitant to do this as I really like the simple properties of the leaf structures. I can see however that a more natural colour may give it more interest. 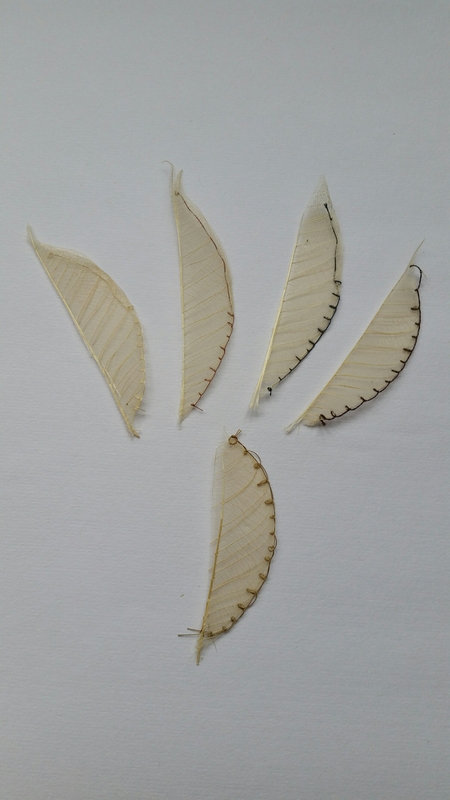 To this end I decided to try tea staining the leaves to start with to give them a slightly darker, more natural colour. Immediately it is apparent to me that this is the wrong thing for me to do as it has quite an orange colouration and does not look any more natural than the light colour they were before. 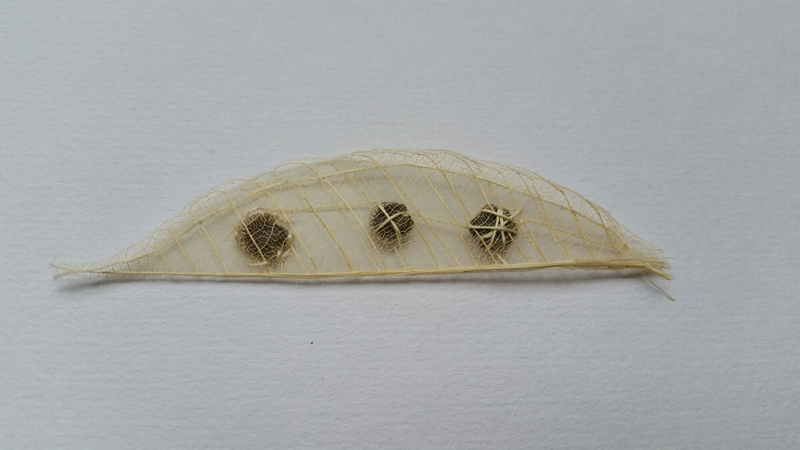 It also makes it more difficult to see the seeds that are at the centre of the structure. Luckily I only trialled this on one of the basic samples to get an idea! It takes away the simple almost ‘Japanese’ look to the piece that I love so much. I tried it first on some spare leaves heating them with and without a varnish layer. The leaves without varnish fared much better. The ones with varnish were difficult to control and singed easily. Without they were easier to control, taking longer to colour. They were very brittle however and I was worried how they would survive the journey to Barnsley for assessment so I decided to give them a couple of coats of varnish to protect them. Singeing the leaves with heat makes a much more natural way of colouring the leaves, it is not uniform so fits in well with my aim of using simple processes for this project. I think that just making this one minor change has improved these samples for the better as I had been slightly concerned that the plain leaves were a little stark especially when they are displayed in a natural setting. I am now much happier with them in general. 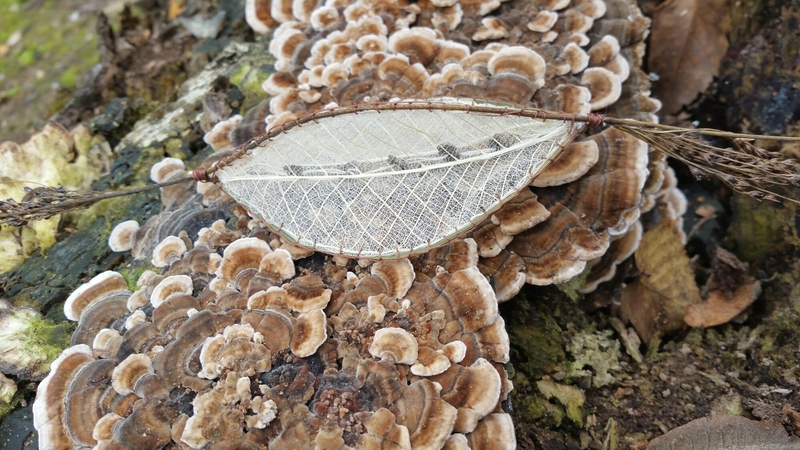 They almost remind me of an amulet or magical object from ancient times and I feel they would be most at home displayed in a woodland setting. Either hanging or laid out on the ground in a pile or making up a triangle or other symbol in a similar way to some if the photographs I took of the pieces when I originally made them. 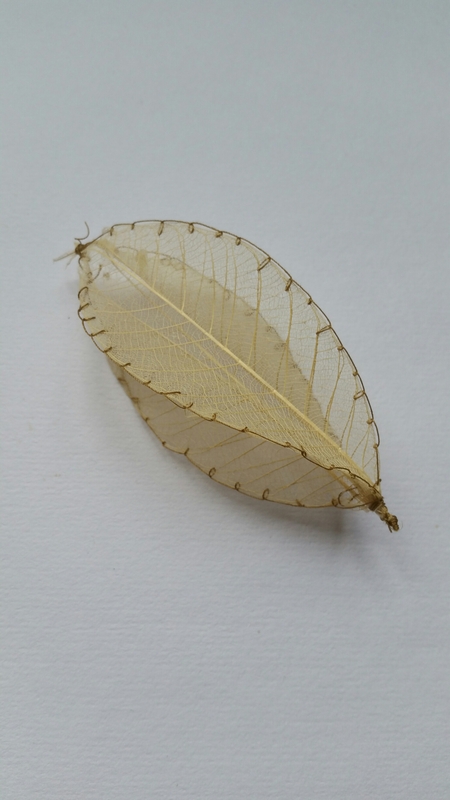 My second idea was to try making the same three sided form from real non-skeletonised leaves. They would obviously have a very different feel to them than the first sample above but it would be a very interesting exercise to use the same technique in a different way. Picking up on the feedback back from my tutor I also wanted to try and combine the pod shape with the wrapping we had both liked in the earlier stages of part 5. 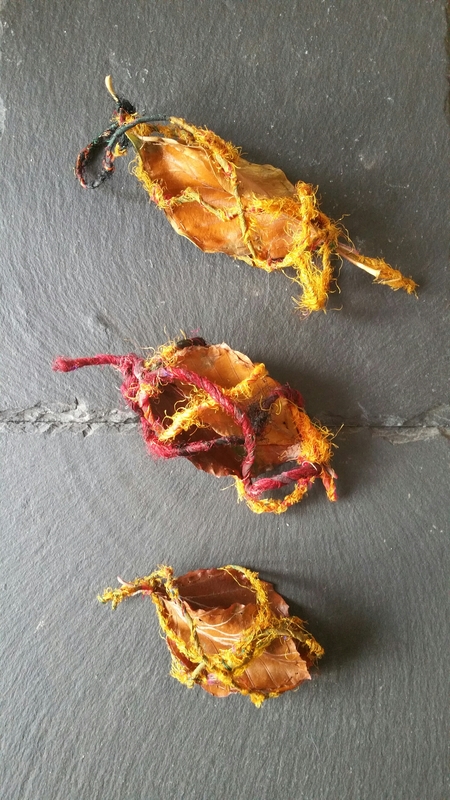 So I made three pod forms from the beech leaves that I had chosen purely based on their shape and the lovely autumnal colours that they are and then wrapped them loosely with the same recycled yarn I had used previously with the bark samples. The loose wrappings were then stitched into place creating a kind of cage for the pod which is very reminiscent of the work I liked by Susan Benarcik where her sculptures reach out into the space around them. I has done a similar thing in part 2 using wire to encase the plastic dinosaur so these samples really do fit in with the journey I have been on through this course. 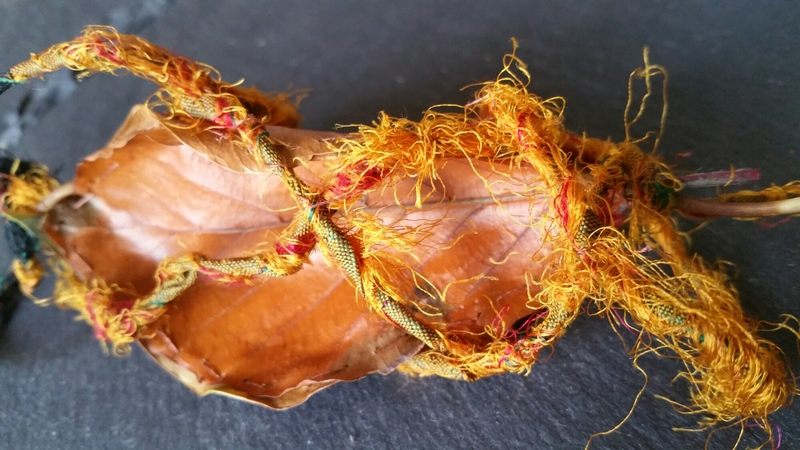 Each wrapping was made with yarn that was the same as or blended with the colour of the leaf when freshly fallen and collected. It will be interesting over time to see what happens as the leaf degrades. 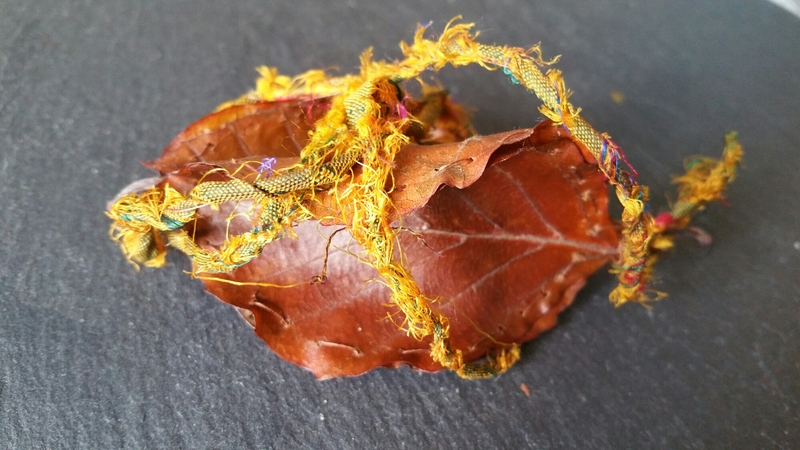 I like the colour in this little pod, the golden colours in the yarn work well with the dark amber of the dried leaf. 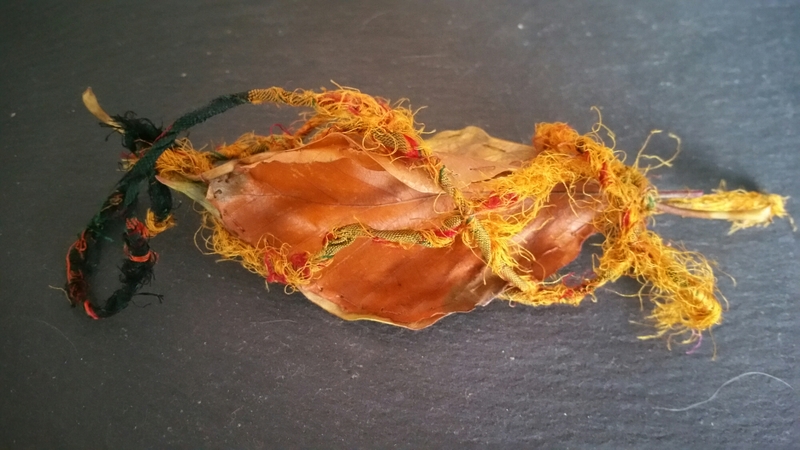 The reds in this pod’s wrappings were originally in the leaf’s colouring but as the leaf dried the red faded away. 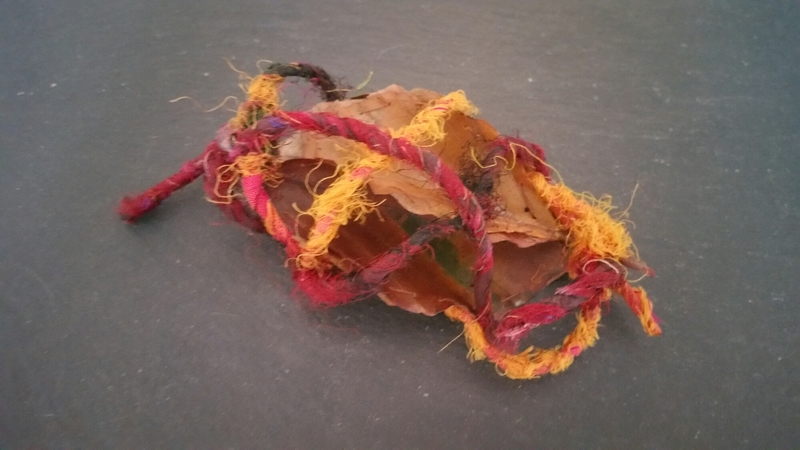 I matched each yarn wrapping to each pods original colour when still freshly fallen. 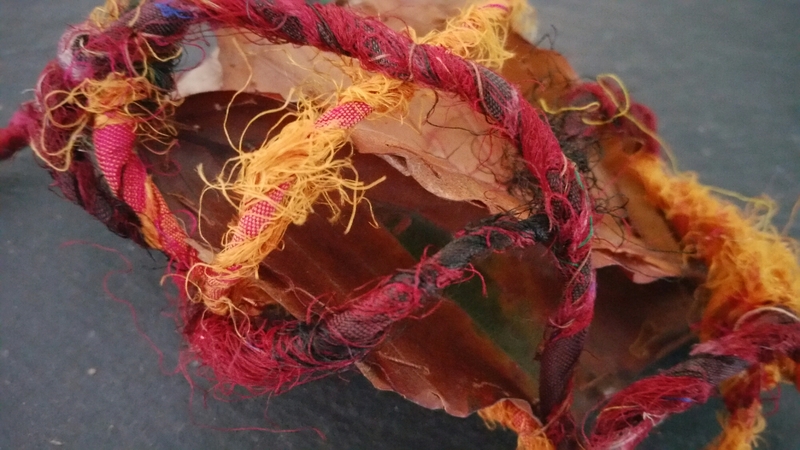 Now the wrappings serve as a reminder of the now lost colour. In conclusion; I am really happy with these last three pods, they really do capture autumn as a theme and are really interesting visually and texturally they contrast well with the first three samples which are neat and precise and focus more on the fascinating structures found within nature rather than nature’s rich colours and texture. All in all I have found creating these tiny structures fascinating and hope that others enjoy them too. They have all been a lesson in patience and ‘mindfulness’ as well as teaching me to slow down and take time with my stitching and keeping things simple rather than the overcomplicating things. 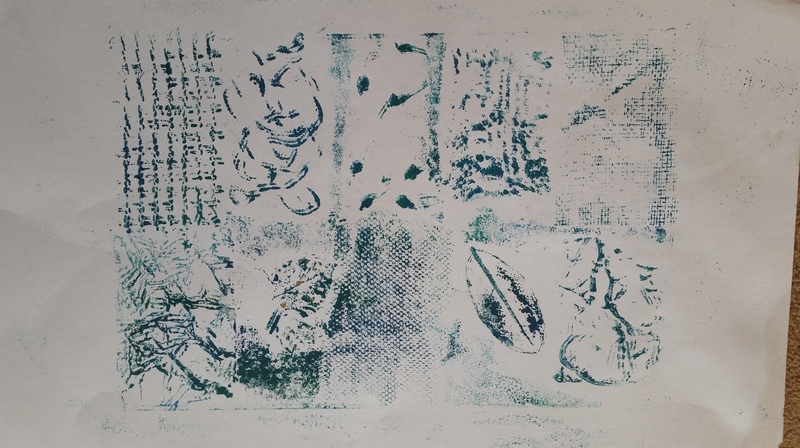 Congratulations Julie for completing Mixed Media for Textiles – I hope you can see the progress you have made and appreciate the skills you have developed. For this assignment you have developed an idea through sample making to create a final piece that visually links strongly to your research material, well done. However the work remains weak in certain areas namely drawing and analysis. I have gone into these in more detail below along with some suggestions. I am starting with drawing, as this remains an area of weakness for you. Looking at your previous feedback I can see I have made several suggestions and given guidance on your drawing. I suggest you return to these to develop and add quality to the drawings you present for this assignment. Your drawings of the bark and leaf samples have been done with care – there is a detailed use of line with good observational skill. However this level is not consistent, the rest of your drawings look rushed lacking consideration and technical skill. There is also not enough drawing carried out during this assignment but you have used it appropriately to study your samples as a reflective tool. The statement above in red has been taken from the assessment criteria document that assessors use to judge the work. Assessors look for this in your technical work and drawing and mark accordingly. I therefore suggest you spend some time working at your drawing and including any new work for assessment of this course. I find drawing very difficult, I am not a natural drawer and find it hard to express myself in this way. I have tried really hard to raise my standards throughout this course but know I have some way to go. In my last feedback you stated that not all drawing has to be in details and that I should try to use it like taking notes – this is precisely what I was trying to do with the sketches that you call ‘rushed and lacking consideration and technical skill’. I am trying to add more drawing to my work during each section but it does not come naturally to me. I will continue to try to improve on this. There is evidence you have successfully used the course material to take you through the process of developing ideas and coming to some creative conclusions. 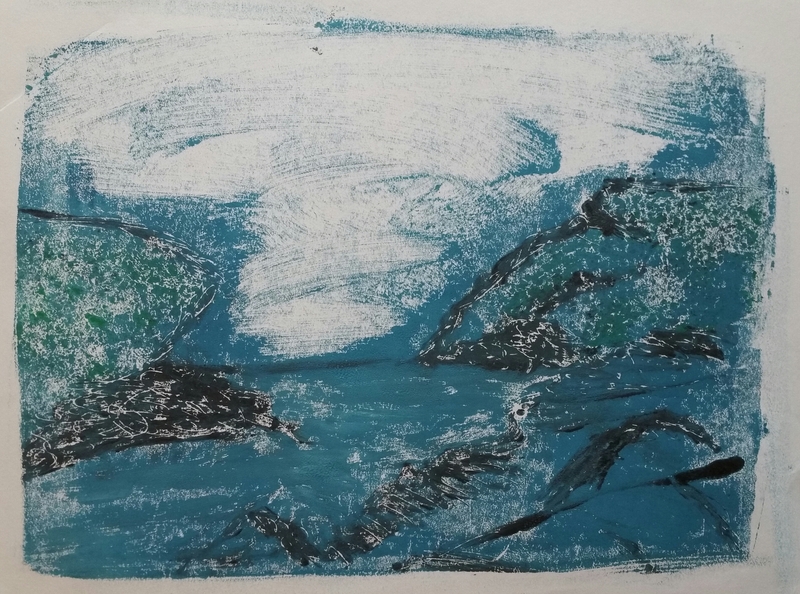 There is a nice logical and considered progression to the work and the ideas as they develop using drawing and reflective thinking. 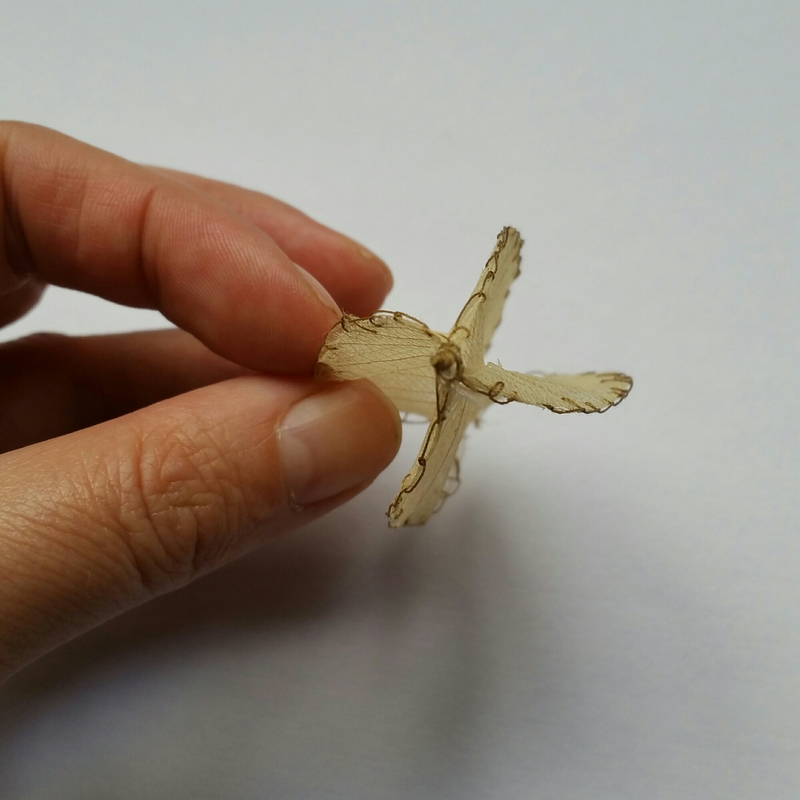 The samples respond well to your previous work, they demonstrate investigation and risk taking – in particular the wrapped bark and leaf structures. Here I can see a sensitive use of colour and engaging textures. 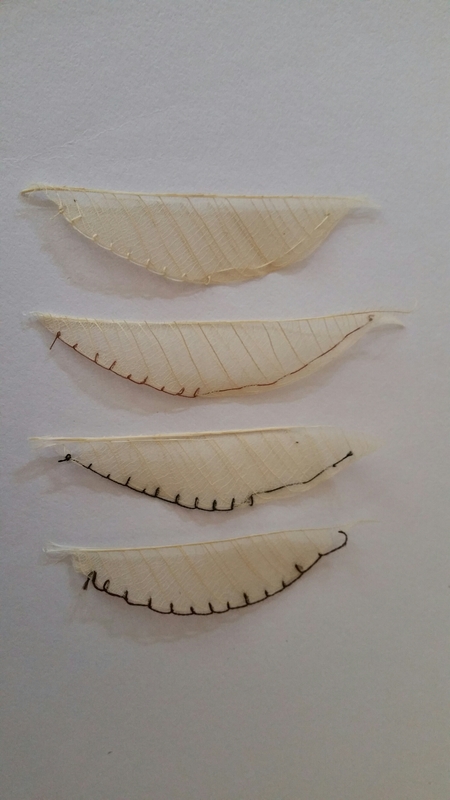 The shop bought leaf samples are less playful though made with technical skill. Your learning log demonstrates an organised approach to problem solving and developing the idea as you tested materials and forms. 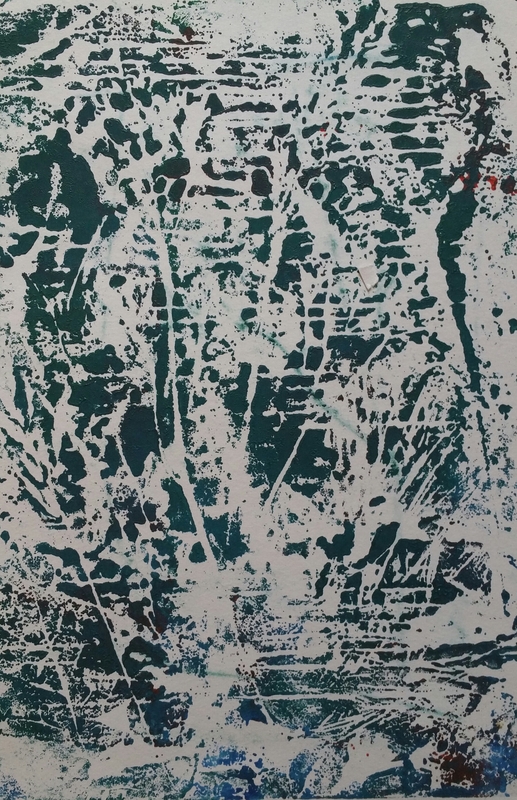 I would suggest the final pieces could be stronger if you combined the knowledge gained in the earlier samples of using found materials and the use of colour in the work. 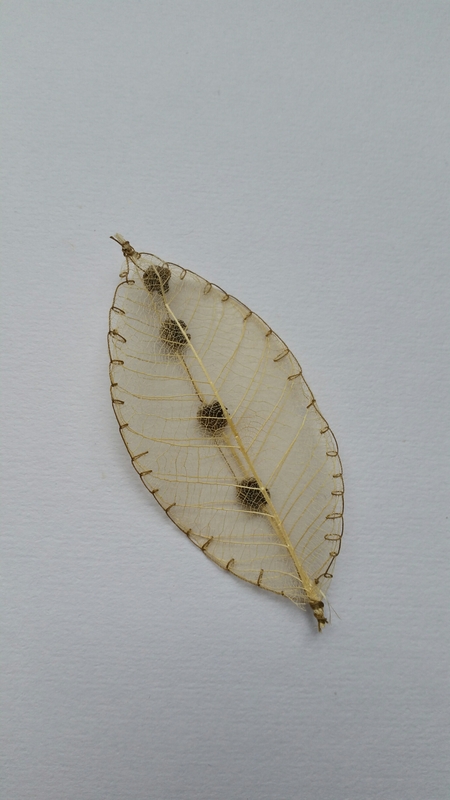 As I explained throughout my research, sampling and prototype making I made a conscious decision to work with the un-dyed skeleton leaves as it was the structure that appealed to me above all else. 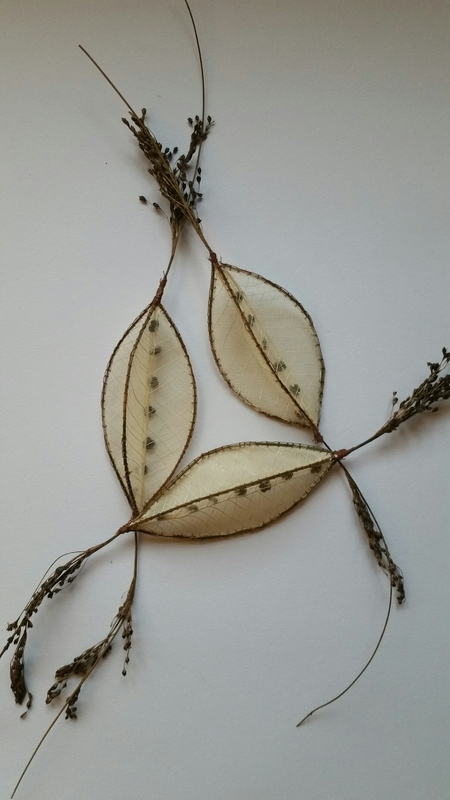 I like the simplicity and purity that the un-dyed leaves represent; I will go back and see if colouring them slightly would be better but I do not want to lose the contrast between the light sheer leaves and the darker seeds within. 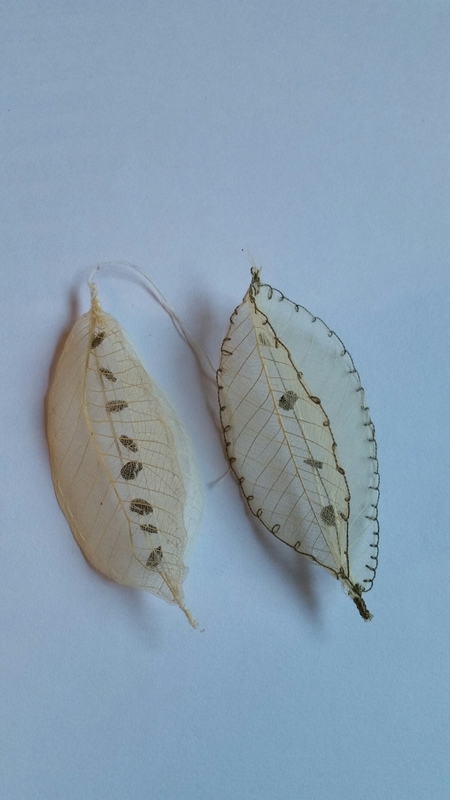 I may also try the same 3 sided shape with found leaves and wrap them as I did the bark samples to see what happens. I suggest you develop your research material using the suggestions and observations above and those made in previous feedback documents. Your online learning log is well organised with a good number of images that support the written material. There is nice discussion of your work as it progresses and how your ideas develop. I do find it a little worrying that in your final reflection you state you ‘hope’ the work has met the assessment criteria. I suggest you use the information on page 11 of your course material Assessment Criteria and the Course aims and outcomes on page five to judge whether the work you have produced meets the standards expected at degree level. Write your final reflective commentary in relation to these, as it will help you see where you may need to develop your work further. I only used the word hope as a reflection on how I am feeling at the end of this course, I have found it hard and I have been very out of my comfort zone throughout. I have tried very hard to be more creative and push the boundaries. 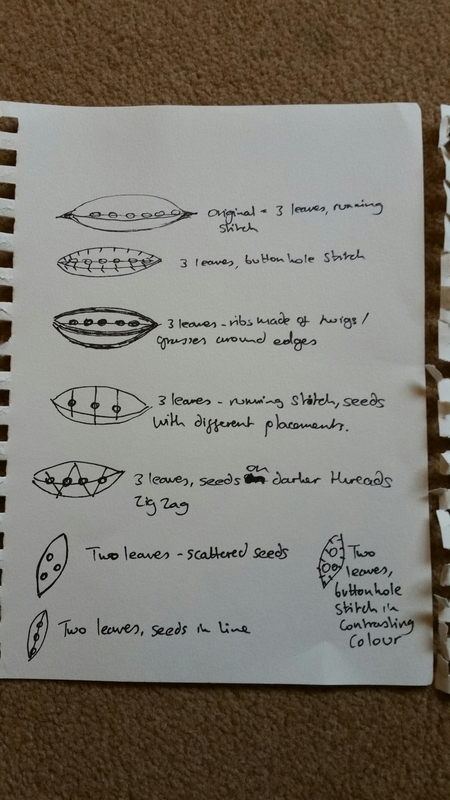 As predominately a stitcher and felt maker, I have found that during this course which contains hardly any traditional textile techniques, I have very difficult to gauge how I am doing. 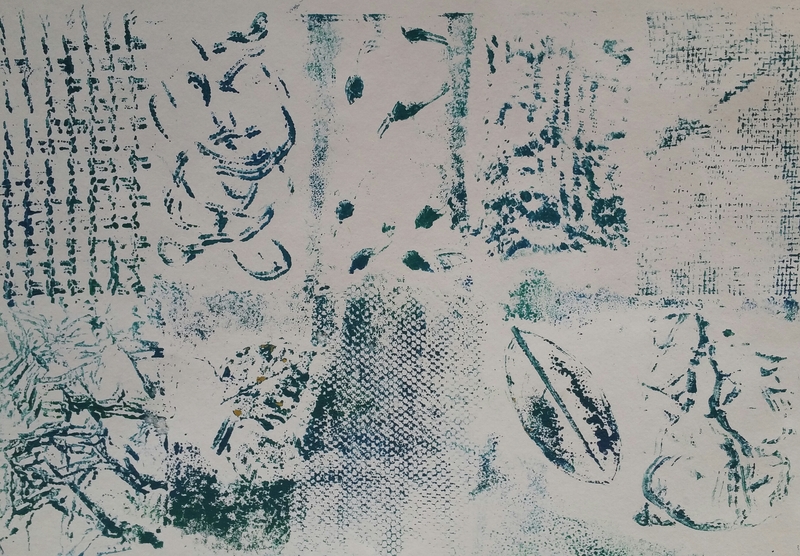 The first three prints were all drawn onto the plate, they are all from the second set of prints that I did and I have chosen them as although they all use the same source, they show how much difference different techniques make. Each one is truly different from the next and they all show a different atmosphere as if you had visited the same beach on different days. The next two prints all have a very different feel about them. More modern and contemporary. Still simple, they would look great embroidered. This next set had to be included purely for their detail. they are simply fascinating to look really closely at. 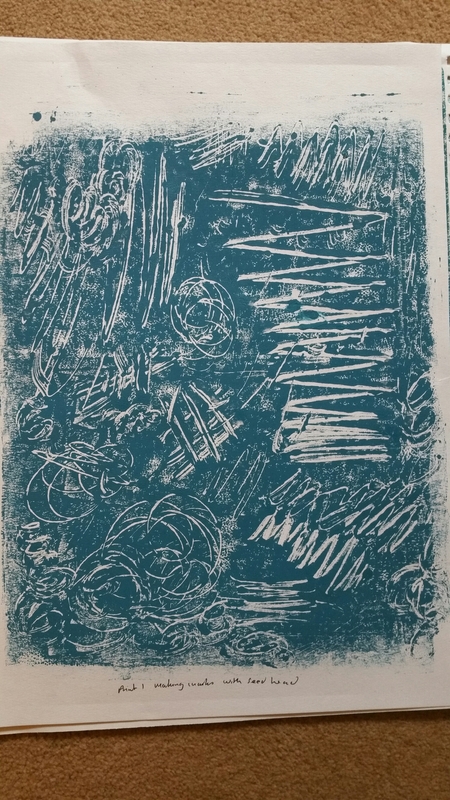 Most of the collatype prints I have included actually come from the first set of prints that I did. Although the second set were clearer and sharper I prefer the texture and colour conveyed in these, particularly the ones using grasses that looked a little boring in just one colour. 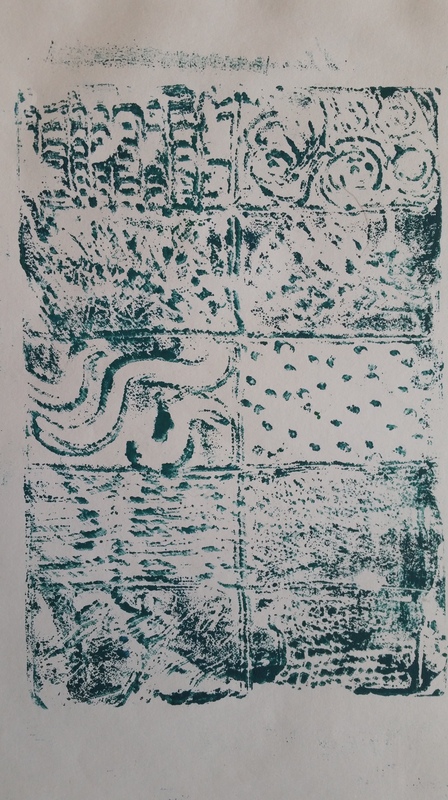 As with the other beach scenes above it is interesting to see the different effects created by the same print block purely by using different techniques or even just different amounts of paint! 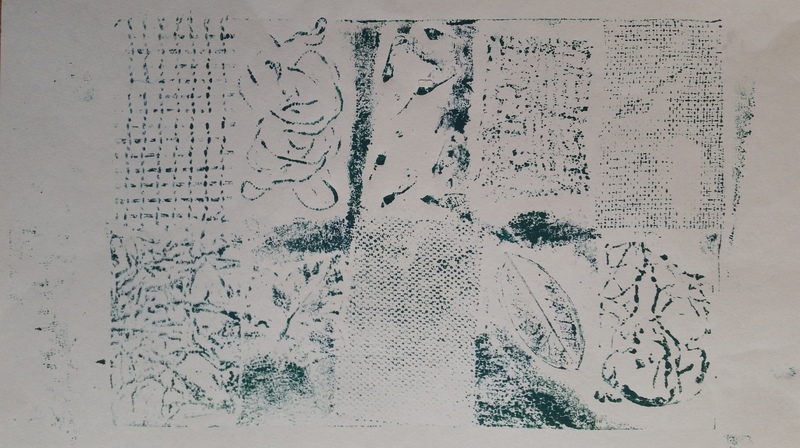 I am returning to part four now that I have finished assignment five to make so changes to hopefully improve the standard of my prints, by far my least successful set of work was the printing in part 4 of the course. My tutor suggested that I re-visit the exercises which I have now done and I am a bit happier with the results this time. I knew where the problem lay with the first set of prints in that I had not used the correct tools or media. The prints were wet and un-defined. I had created some interesting backdrops for working into but from a printing point of view it was a disaster. So I have returned to the start and re-run the exercises to try to improve. I work at a school now so spoke to colleagues in the art department to get some hints. The graduate assistant has just finished her degree in printmaking which is useful to know! 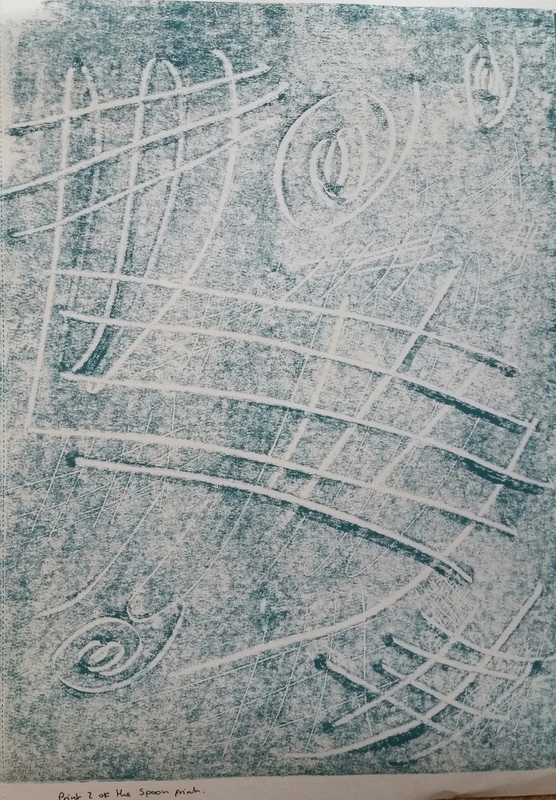 The second print is much rougher, lighter in colour and a lot less refined. You can still see the pattern coming through but not nearly so clearly. 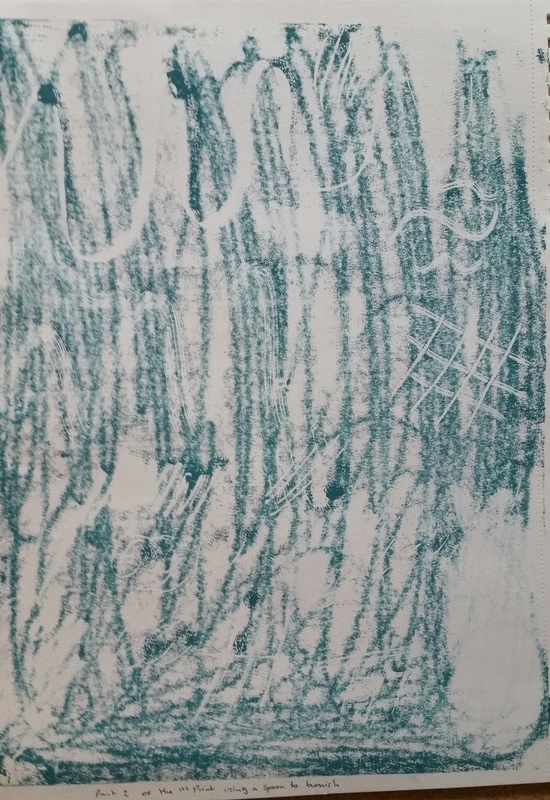 The ‘scribble like’ background markings are due to me using a spoon to rub the back in an attempt to pick up more ink. 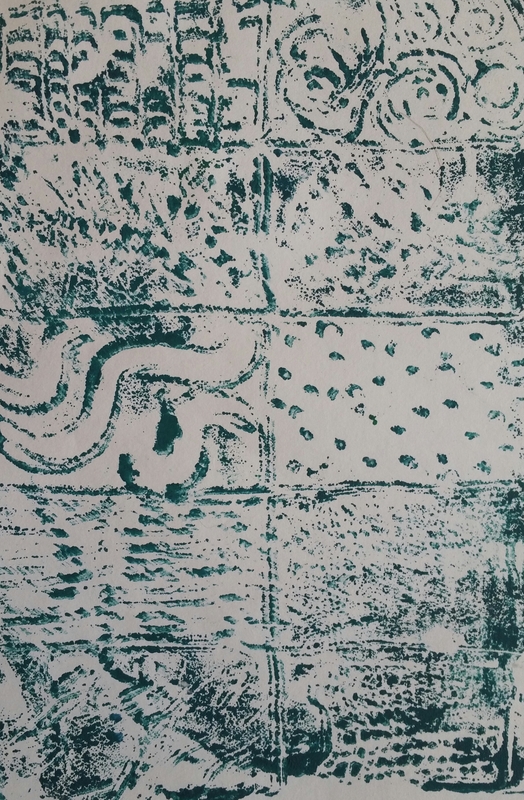 The fifth print used a spoon to make markings. 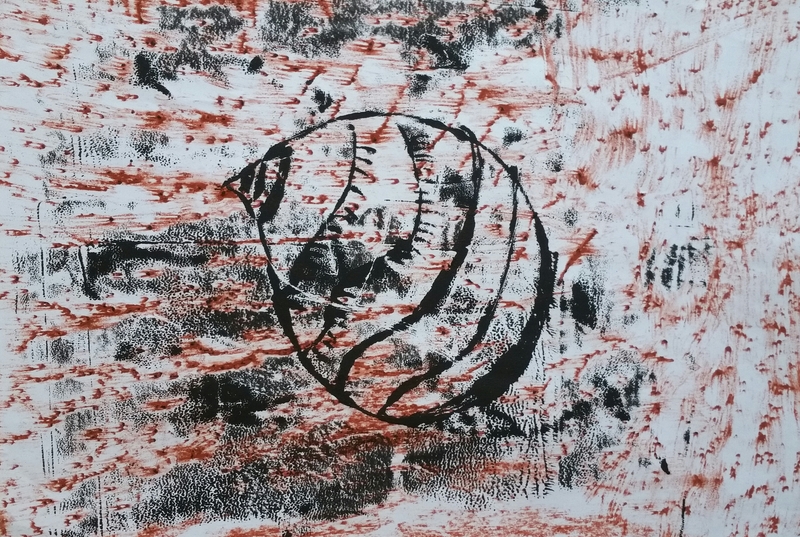 I tried using the head and handle of the spoon, angling the spoon as I dragged it through the ink in attempt to produce as interesting marks as I could. After taking a second print from the spoon made plate I felt it was time to move on to the next exercise. 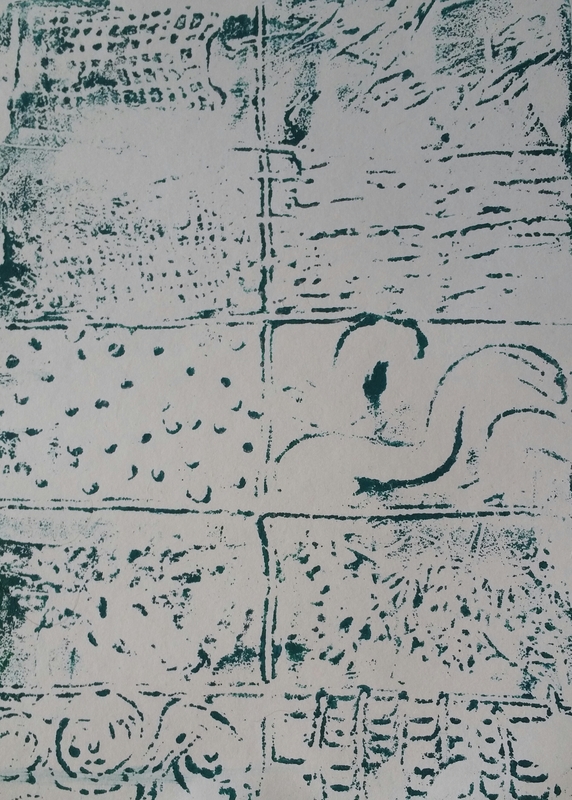 This was to draw onto the plate and take a print. It all sounded really easy but as I had found out last time it certainly isn’t. 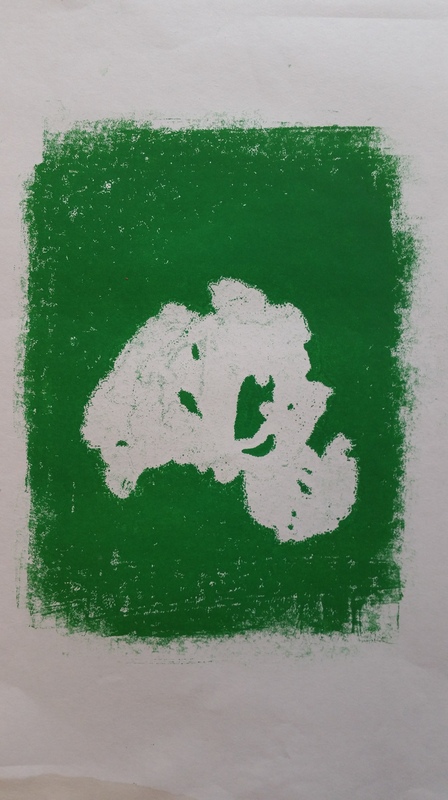 The ink dries quite quickly so the first colour is almost dry before you have finished the second and by the time you go to take a print there is hardly any wet ink left! 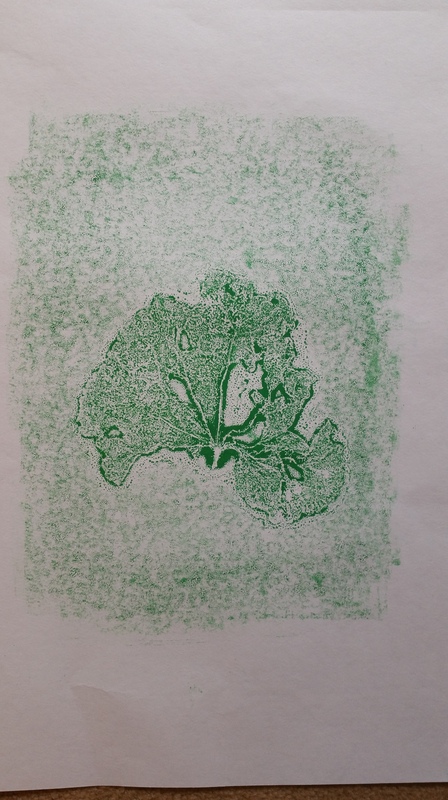 This is what happened to my first print I must say though that I quite like the effect. Had I printed on a different colour paper I think it could have worked quite well. For my second attempt I laid down a layer of ink then drew over the top attempting to add a background that was intrinsic to the print as well as helping with the drying problem. This created a very different effect from the first and I was quite pleased with this different style. It is more posterized than the first, a lot darker and atmospheric. The third print in this set did not go so well as I tried to remove some of the sky colour but feel that I went too far. I think it dried the paint again so hardly any was left in this area. 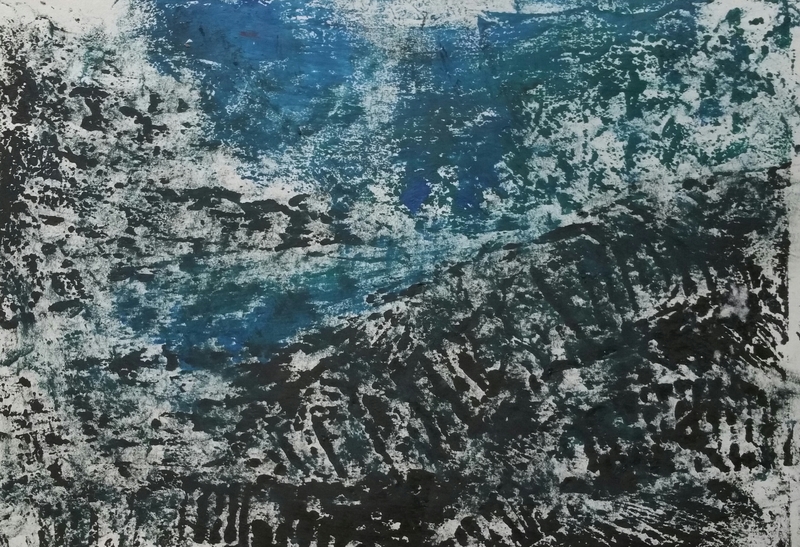 My husband felt that it reminded him of a misty evening at the beach as its getting dark so I guess that’s one way of looking at it. I now moved onto the next exercise which was to draw from the back. I had real difficulty with the first attempts at this with only one semi decent print coming from it. I had been told to keep the ink as sparse as possible and quite dry so as to not spread all over the picture. This I dis and I also used a pen rather than a pencil which really seemed to help. My first print was a rough drawing of a shell. 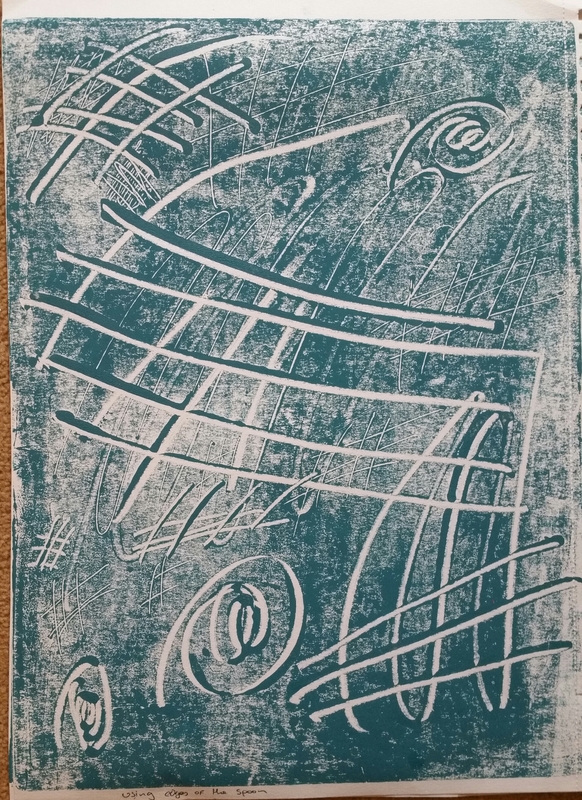 I used a piece of paper that I had already prepared using wax rubbed over a surface. This added to the beach feel. 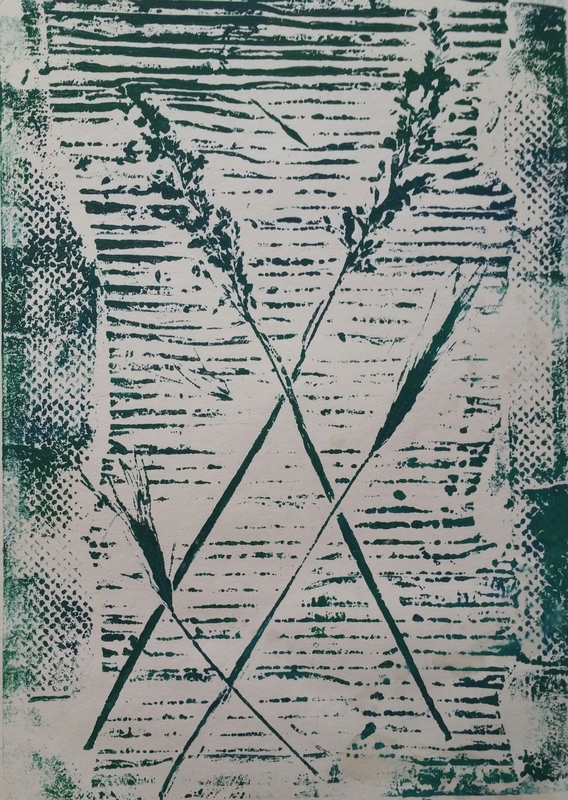 I like the lines in this piece and the way that slight marks add to the background texture. Continuing with the beach theme I roughly drew one of the sketches I had taken from my sketchbook of an anemone. Again a really good result I was so excited that it had worked at last! 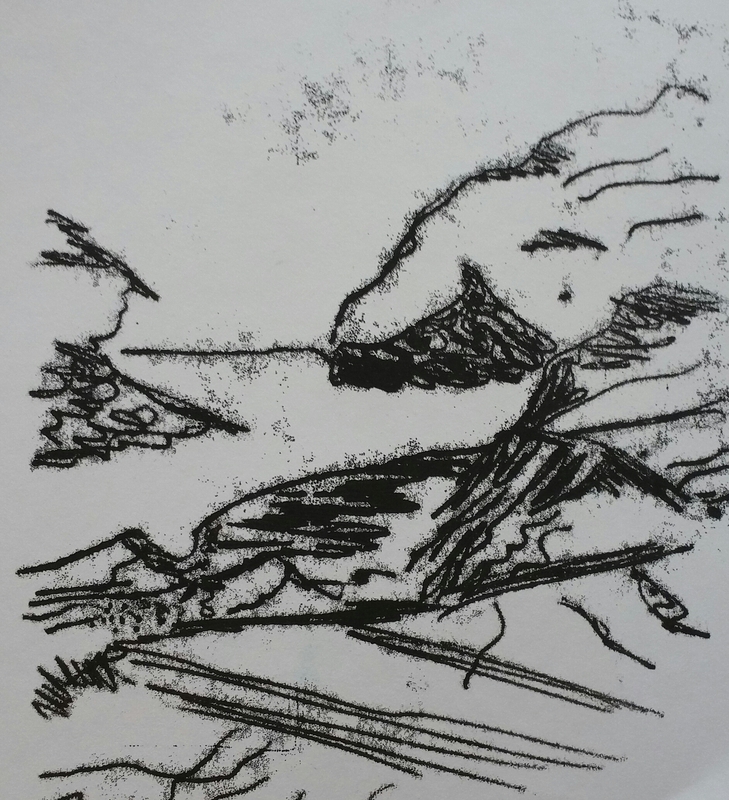 My final print uses the same beach scene as before. This time I used plain white paper and black ink trying to create a simple look. This I think is my favorite of all. It is so simple and actually looks how I wanted it too. 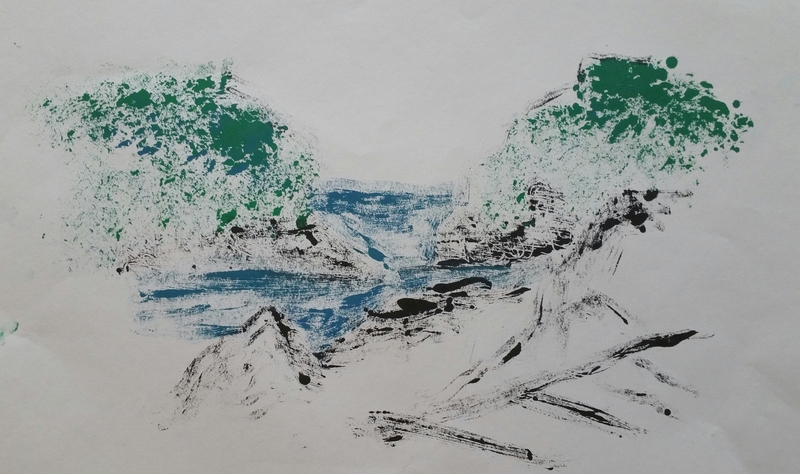 It captures the essence of the rocky shoreline perfectly without any complicating factors, simple lines and inferred textures bring it together. The detail in the second prints is amazing and this is something I will definitely be trying again with different plants in the future. I really like the lines produced but also the background texture. 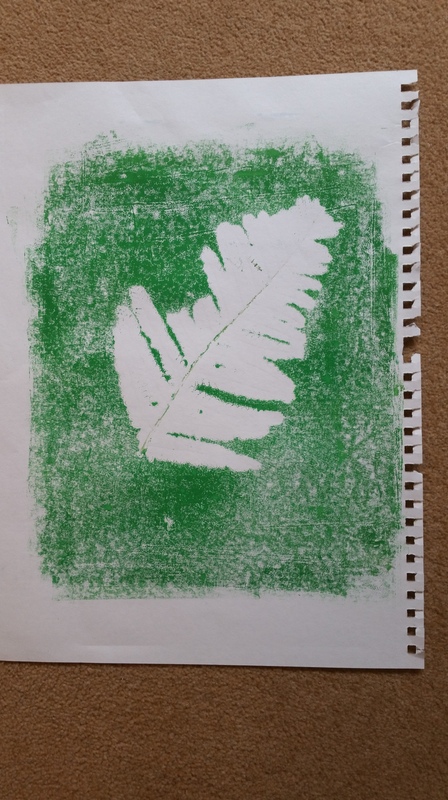 A similar effect could be achieved by simply printing with the leaf but you would not achieve the background texture or the level of detail. Again my first set of prints are really about experimenting with the technique. 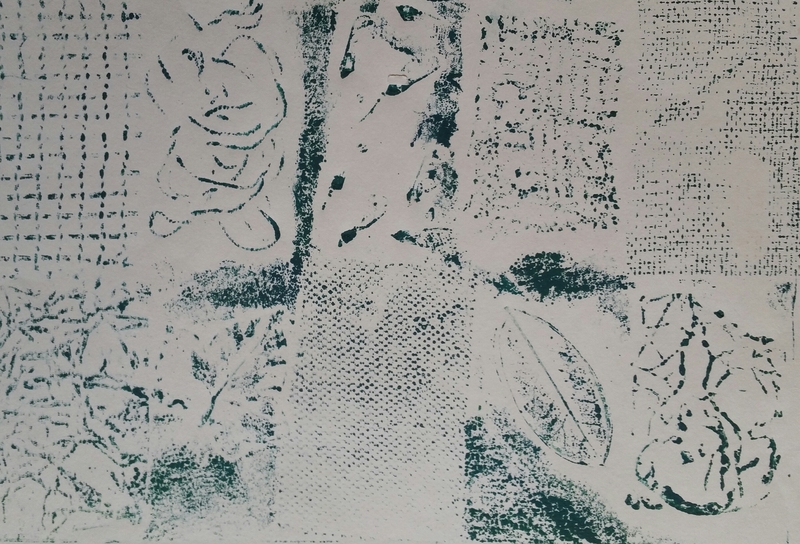 The collaged block worked better this time with the new ink and I did manage to get a reasonable print from it. The polyfilla block however still continued to be hard to print from. Both blocks tended to move whilst I was printing. Without a press it is so easy to slide it about ever so slightly to cause a double exposed print. I tried a few times but really couldn’t improve much on it so I have admitted defeat and moved on to the other blocks to see if they would print any better. 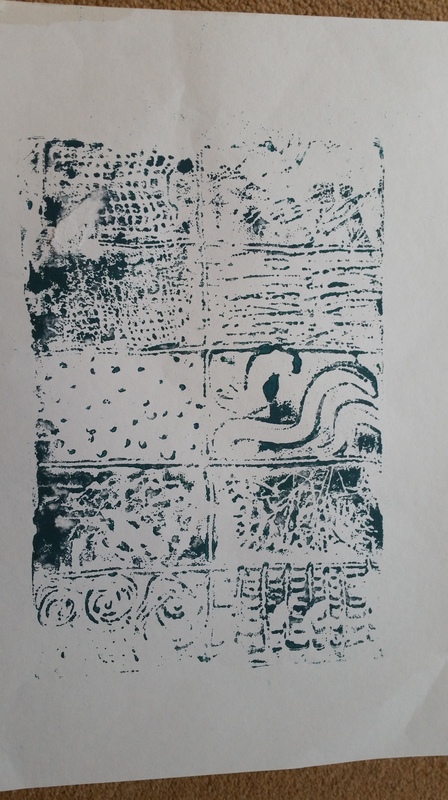 I did have a little more success with these blocks, after a few attempts I did manage to get some good, clean prints from them. They lacked some of the texture from the first time that I printed with them though and don’t excite me any where near as much. I think this may be partly down to the colour. On the first set of prints I mixed colours in a rainbow like effect on these blocks which made them look a lot more exciting. These are just too plain for me but they are sharper and more defined this time round. The real exception is the following print. 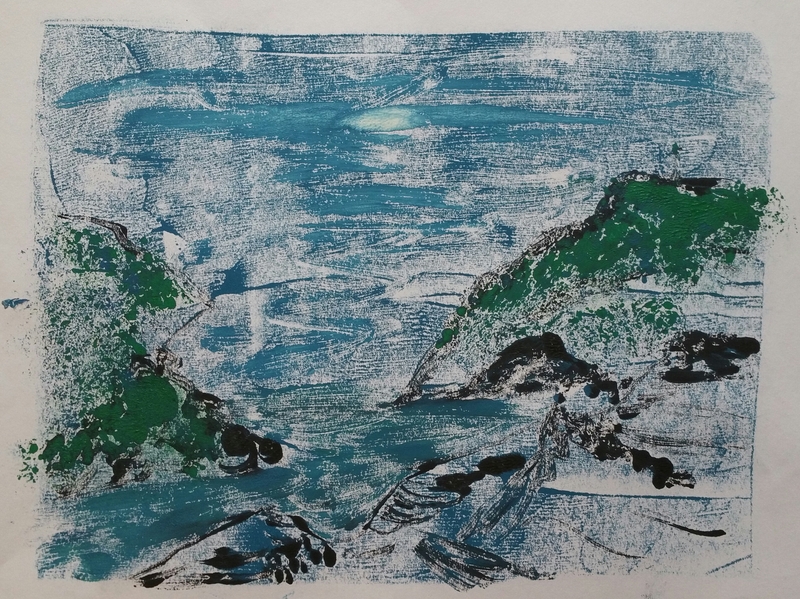 I had liked the original prints I had taken using this block but with more definition it works even better, It is really atmospheric and looks like a stormy sea. It was a steep learning curve but I am pleased to have persevered and feel that I did create some reasonable outcomes once I had gone back to revise and re-do parts on the advice of my tutor. I have included both the good and bad as a comparison and to show my progression. I have enjoyed this part of the course. it was nice to take some of my ideas a little further. 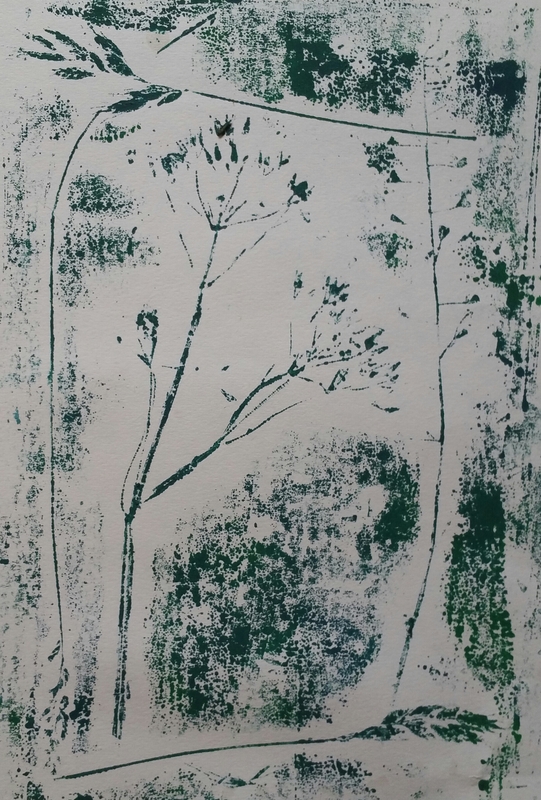 I felt that there was a lot of samples I would like to have taken on to finished pieces and I would like to explore using found natural objects in the future. I found that quite a few of the ideas I had during the sampling stage could easily have been displayed as a collection as a whole. It is a shame in some ways that they could not be left as a collection of ‘rougher’ samples as if they were just made on the spot, a result of things collected during a walk. ‘One offs’ for experimental fun rather than complete resolved samples which can become almost too polished. 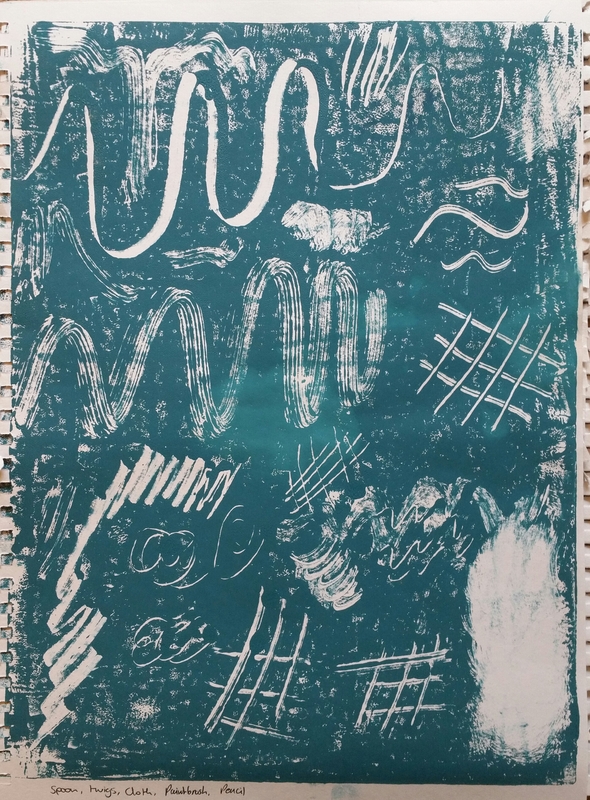 I am starting my first level two course next so hope to have the chance to develop my own work then possibly in this kind of experimental explorative semi-permanent way. I am satisfied overall with the outcomes from this part of the course. I hope that the samples I produced are experimental enough, they felt it to me anyway. I have enjoyed the chance given to us during this course to play, a materials led approach is much better for me not being forced to design everything in a sketchbook first was liberating. I hope that it all meets the assessment criteria however I am usually wrong on this point so let’s say I hope it is all okay. Overall I have found this course very useful in equipping me with other ways to work towards an artistic outcome. I would have liked to see a little more emphasis on using stitch and maybe more ‘textile’ rather than plaster etc. but I suspect that is more my opinion than most people’s. The printing section was not for me. It is obviously not a set of techniques that I can master. This is the second course where my printing abilities have been non existant! It is just as well as I have never wished to use printing as a technique. I only occasionally use it to add background pattern or texture so I am not that concerned. What would be of more interest to me would be to see some of the newer ‘eco dying’ techniques. These fascinate me and would fit far better with my current interests and work. I know that the OCA constantly review the courses. I feel with this course a little more explanation of what is expected would be useful. I found that for most of the course I have been confused as to what I was supposed to be doing. 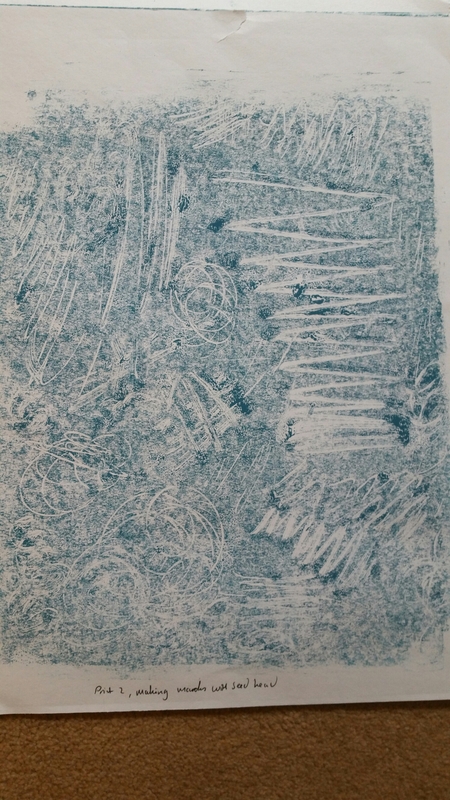 For example in the dreaded printing section at no point did I see that we were to use drawing to record the prints. This was only pointed out to me later. 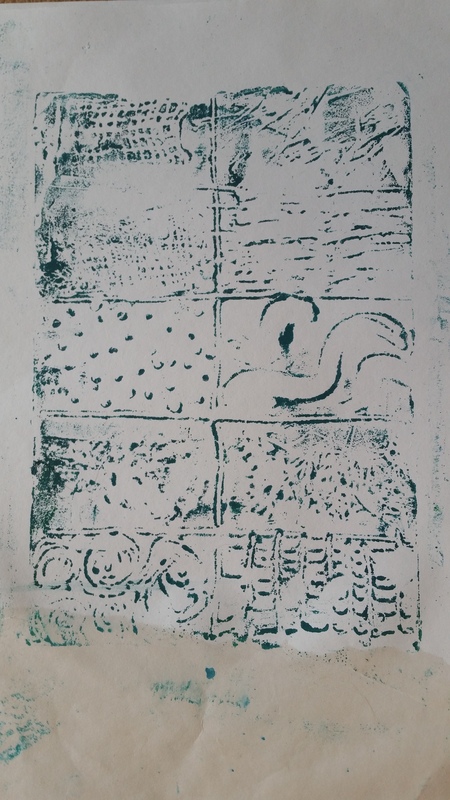 All in all I did find the course instructive but I would not say that I enjoyed it as much as the first two courses which were more traditionally textiles based. I appreciate that things need to move forward and I like to see innovation but I think I am happier with fabrics and thread (or maybe grasses and leaves) rather than plaster and concrete. The one exception to this was that I did enjoy experimenting with clay. If I could find somewhere to trial ideas I had around pressing embroidery into clay, firing and glazing it maybe to produce sculptures or pots I would. Using air dry clay did not go far enough for me. I need to have a word with the local potteries to see if they can help. Most of all I am looking forward to level 2. I really am hoping that the higher level will enable me to produce work that I want to rather than being too prescriptive. Hopefully this will help me to develop my personal voice a bit more. Everything I did needed to be kept neat, clean and precise. The structures are so intricate that any mistakes would show up. A stitch out of place would shout out to the viewer. I could not be tempted to rush. Mistakes were more likely to occur if I did. The leaves are so delicate that if I rushed I would ruin them. I needed to relax as the tension of the stitches was crucial. Too tight and the leaves would be damaged. Concentration was vital as I needed to be precise. 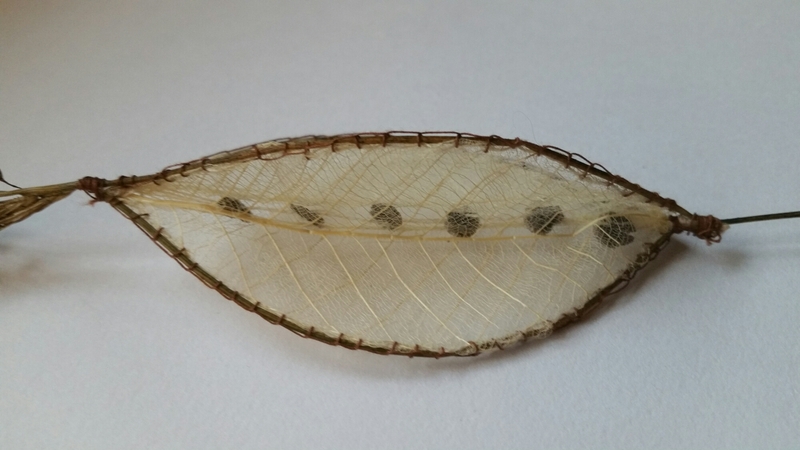 I decided to develop the seed pod with grasses as a final piece. 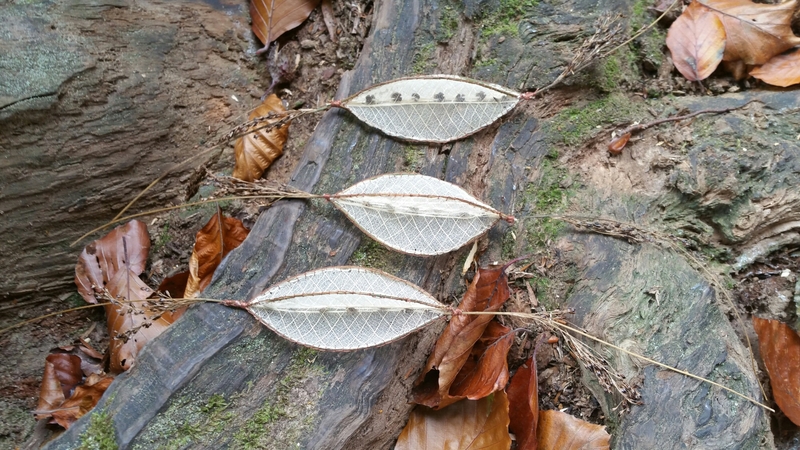 I chose to make three pods all identical (as far as is possible using natural materials). It will be the first time that I have made a multiple of something so it was to be an interesting exercise. Making them was relatively simple as I had spent so long refining my samples to check what worked best. As always with these materials one of the main challenges is not to snap or tear them. each one had be made slowly and gently. 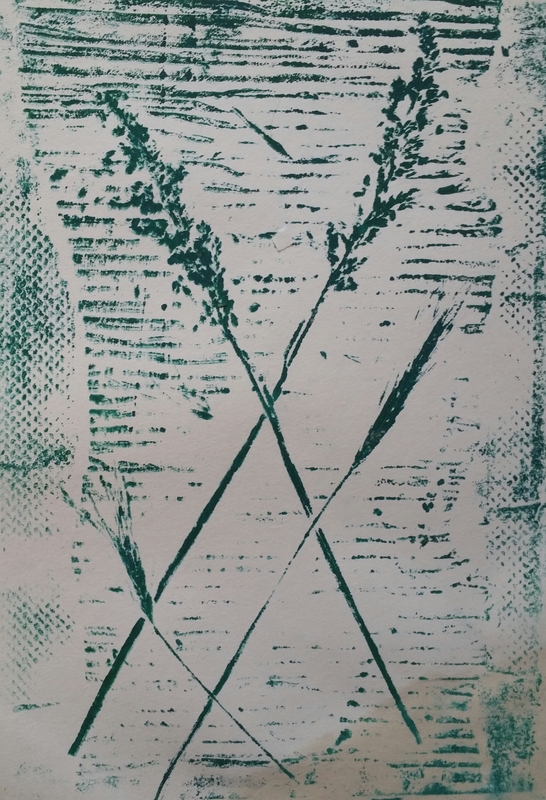 I chose to arrange the leaves to make ‘cris-cross’ markings if examined up close by alternating the leaves. To be honest it will probably only be noticed by a few but it was an important touch for me to add. Making each one as close to identical to the others was not very easy. 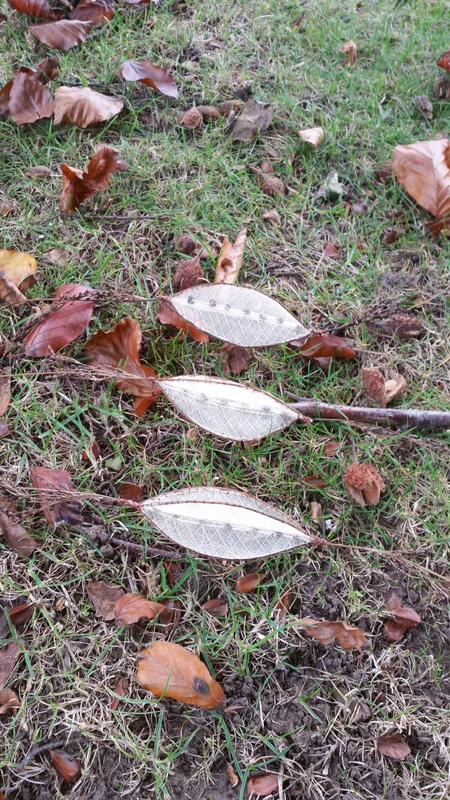 each leaf is a different size and a slightly different shape. To join them takes a lot of care and careful stitching. 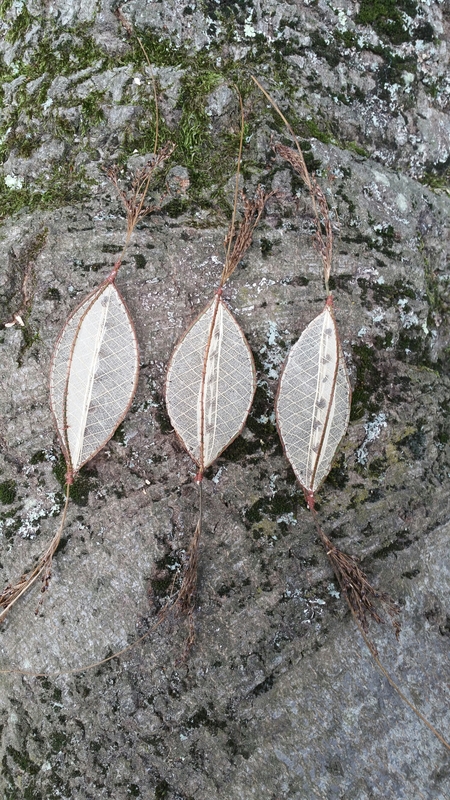 on the final samples I used a matching thread to sew the leaves together before stitching the grasses around the edge. 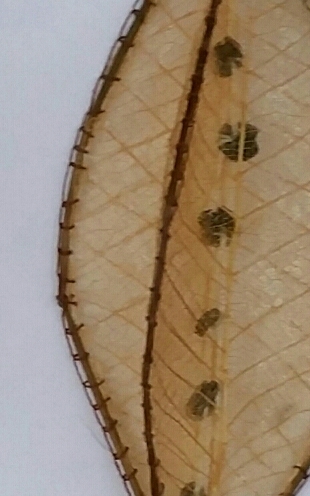 This helped to stabilise the leaf before using the buttonhole stitch around the edge and looked better than using brown thread for both stages of stitching. I am really pleased with the final samples. They work really well together as a group. 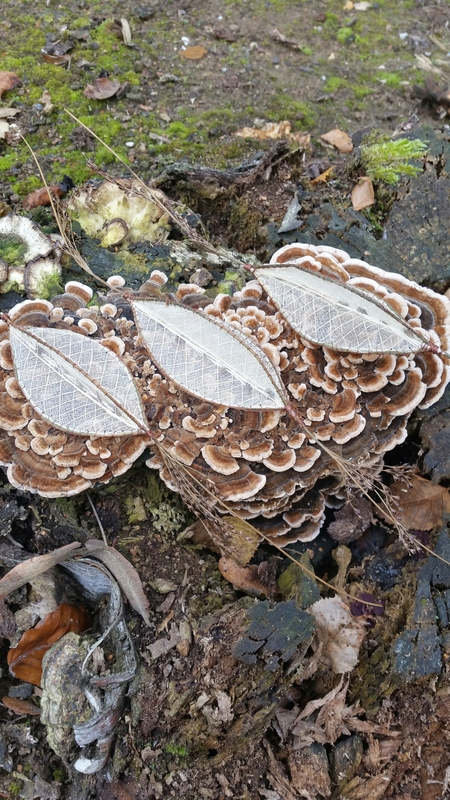 Each is obviously unique but are as close to identical as possible just like nature’s structures. I enjoy the contrast in texture and lines within the pods. 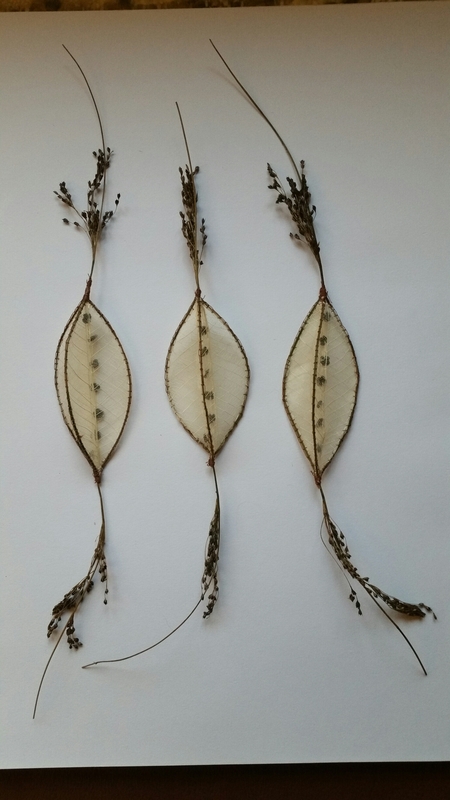 The sheer lightweight leaves, the smooth crisp line made around the pods with the grass stems, the opaque seeds and the flowing grasses. I hope that people will find them as intriguing and interesting as I have. I don’t think I would change anything if I made them again, however I would like to try some on a different scale. This would be quite difficult; especially larger scale as materials may be difficult to source. I would also like at some point to come back to the other samples I produced during this project and develop them further as well. To finish the project I took advantage of it being a nice autumn day to take some photographs against natural backgrounds and some against non natural backgrounds, we have some rather impressive old tree stumps near my home so I thought I would start there first. 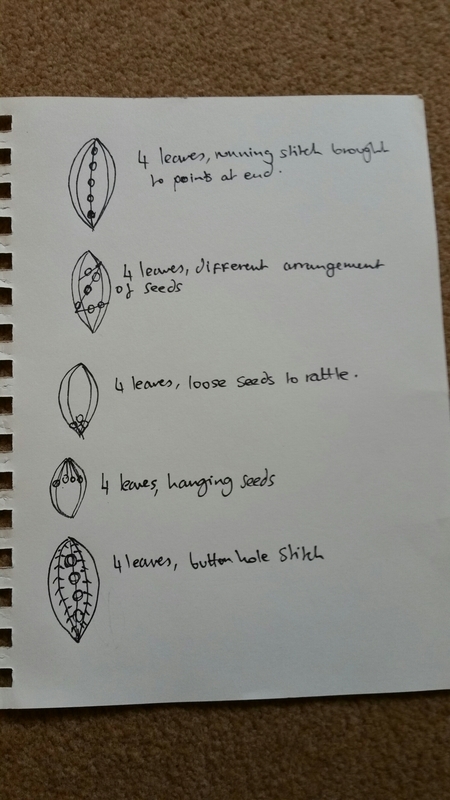 Ideas for using four leaves; enclosing the ends to form a ball. I am not proposing to make finished samples of all these ideas. Some will be working samples. For example I will soon be able to see how a different stitch will work by trialing only a tiny section. It may or may not work with the leaves ie. it may rip them or the colour may not work and stand out too much detracting from the impact of the delicate structures in the leaves. Stitch trials: Starting from top: Cream running and buttonhole stitch, mid brown stitching, black stitching, dark brown stitching. I started by trialing cream buttonhole and the running stitch as per the original sample. I knew I already liked the cream on cream look but I must say that I do prefer the buttonhole stitch to the running stitch. I think this is due to the fact that it creates a border or rather an edging around the shape. 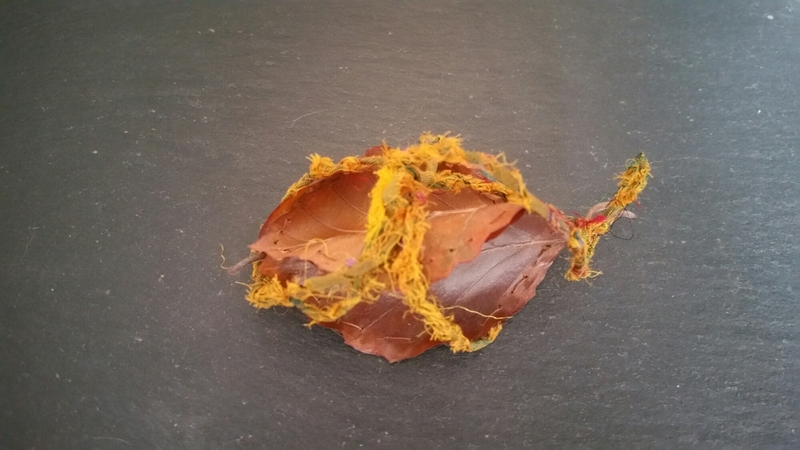 I then moved onto trying different colours of thread but still remaining within a natural pallette. I experimented with a mid brown and black thread but found the mid brown a little light and the black a little too harsh. I finally tried a dark brown cotton which created a much better contrast. It almost gives a weathered or singed look to the edge of the pod. I still was not sure of the colour so I returned to some of my earlier samples to look at the colours within them. 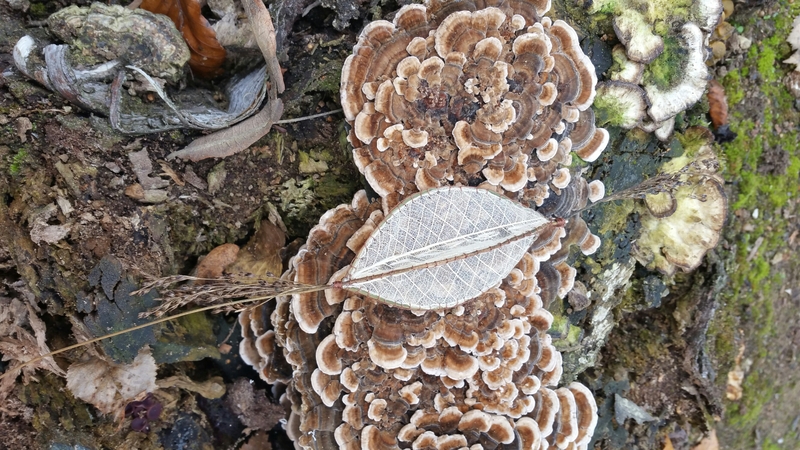 The darker veining on these leaves was particularly of interest. I decided to match this against my threads. Unfortunately despite a huge range of embroidery threads, I could only find some old polyester sewing thread. This is a little ‘hard’ and is not particularly good to work with on such a delicate item and kept looping as I stitched. I will need to go to my local craft shop and try to find some better thread. 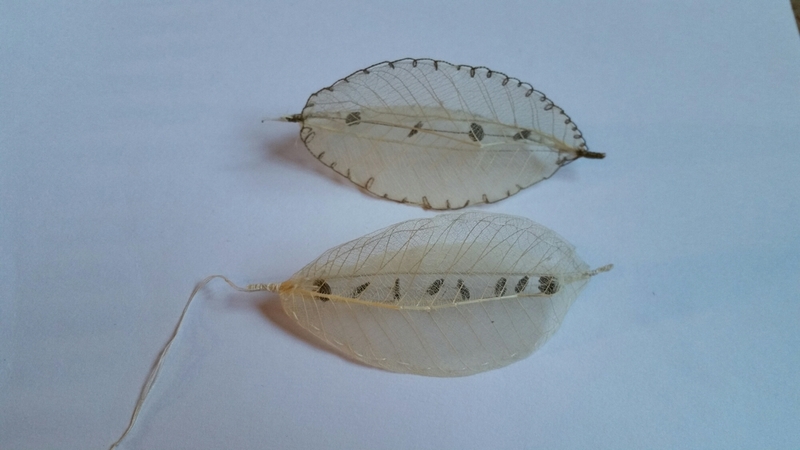 I do feel that it is a much better colour and I am satisfied that it will work well with the buttonhole stitch to both construct and embellish the pods. 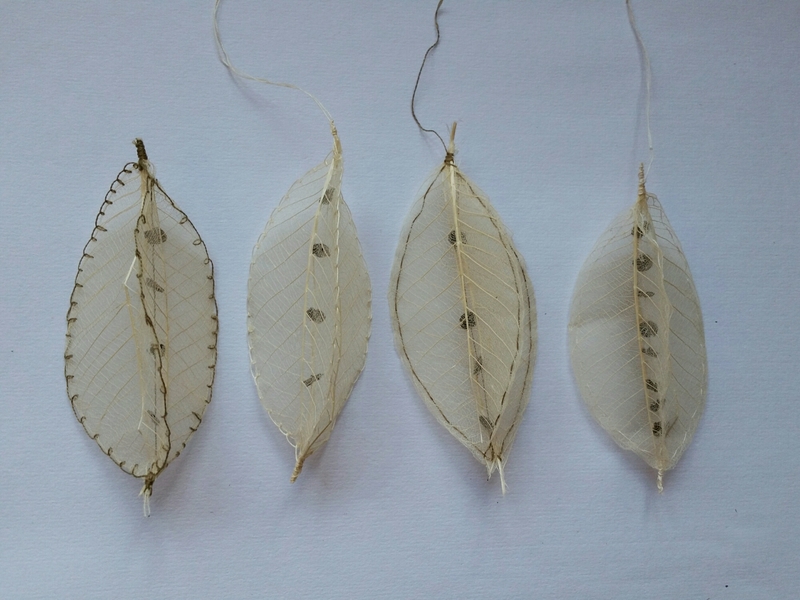 I thought I would make a couple of quick samples to try using the leaves to make different types of pods for instance the pod above which is made using only one leaf folded in half (inspired by the shape of the stitch samples above) and the one below made of two leaves stitched with buttonhole stitch in the new thread colour. The pod above reminds me of Honesty seed pods. I used to love them as a child (we had a small patch that grew at the bottom of the garden) and I used to enjoy dismantling them to examine them and remove the seeds. 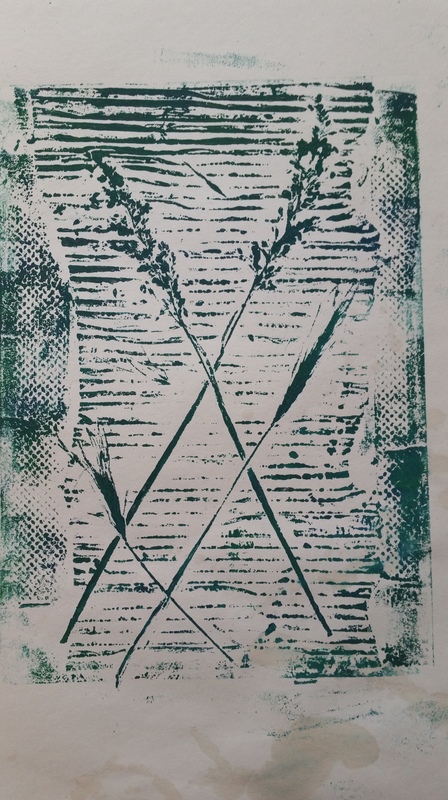 The picture below show a quick trial using four leaves (as the ball in previous posts) but bringing the ends to a point rather than enclosing them. I feel it is more interesting view from the end than the other pods but I don’t feel it works as well as using two or three leaves. Now I have put them together to compare them, I am not sure that I am so keen on the darker buttonhole stitch around the edge. 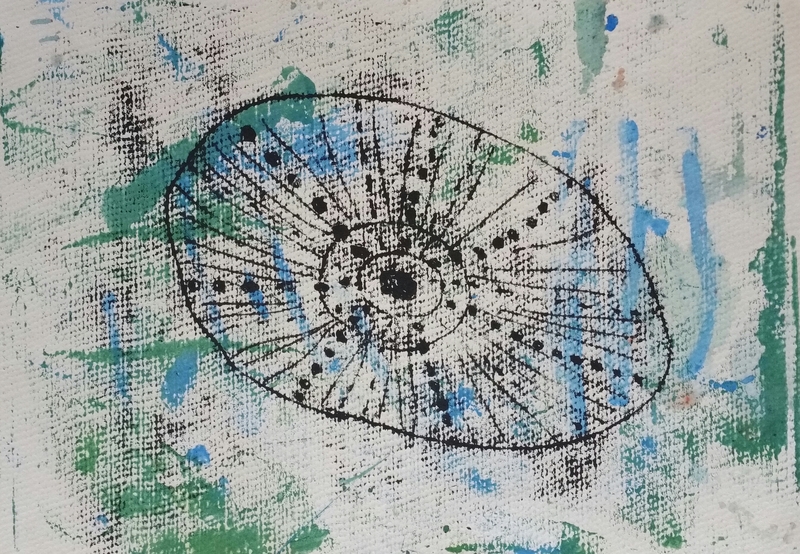 I feel it is in danger of detracting from the simplicity of the structure and also drawing the eye away from the seeds within. It is amazing how much the piece changes once it is complete with seeds. 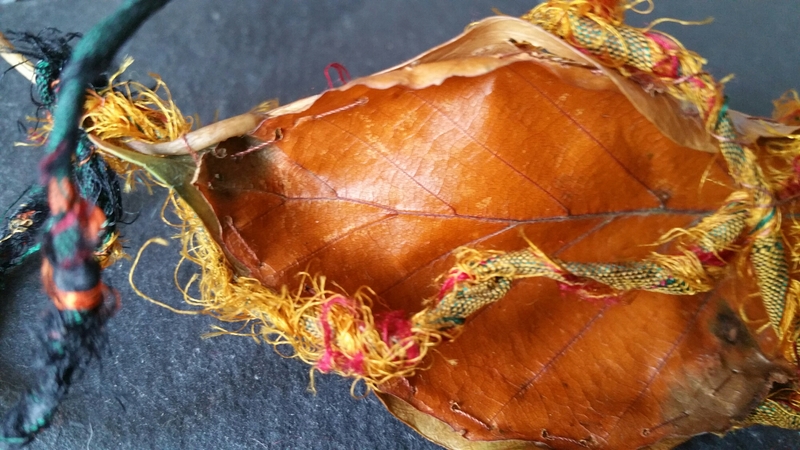 Without the seeds, just stitching the leaves together, the brown thread works well giving the work a contrast. However once the seeds are in place the emphasis shifts completely and the brown doesn’t work as well. It focuses the eye on the outline rather than allowing it to continue through to the centre. I decided to try two more samples; one with cream buttonhole stitch and one with brown running stitch and placed them against the other versions in a simple row. Of the four samples above my favourite is the cream thread in buttonhole stitch. It seems to my eye at least that the buttonhole stitch gives just enough of an outline without cluttering the view of the audience. It adds a bit of a special finish to the piece. 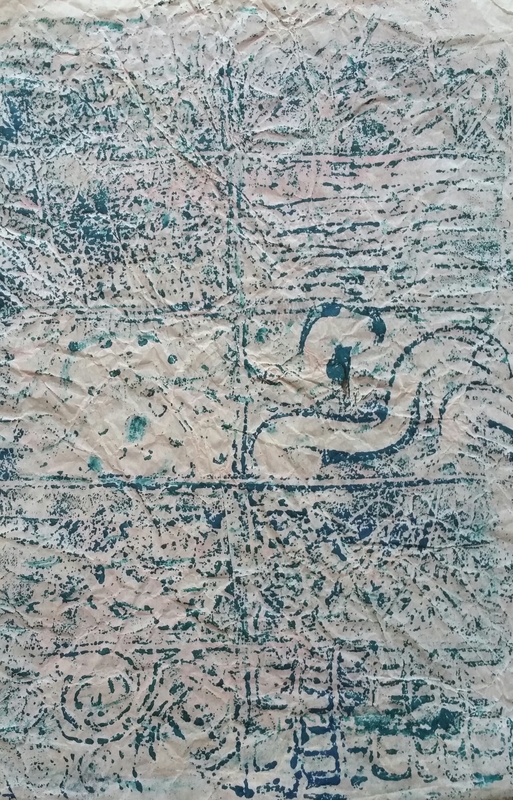 Reminding the viewer that it is a stitched piece. Putting the four samples together also proves that I prefer to see more seeds rather than fewer and that keeping the display method simple and neat will be important. I was still concerned that it was not quite there yet so I though I would try one last variation that was on my list: using grasses around the edge of the pod. I had really enjoyed the movement of the grass vessels I had made earlier in the sample making stages. I felt that this was missing from the pod idea so I thought I would give it a go. 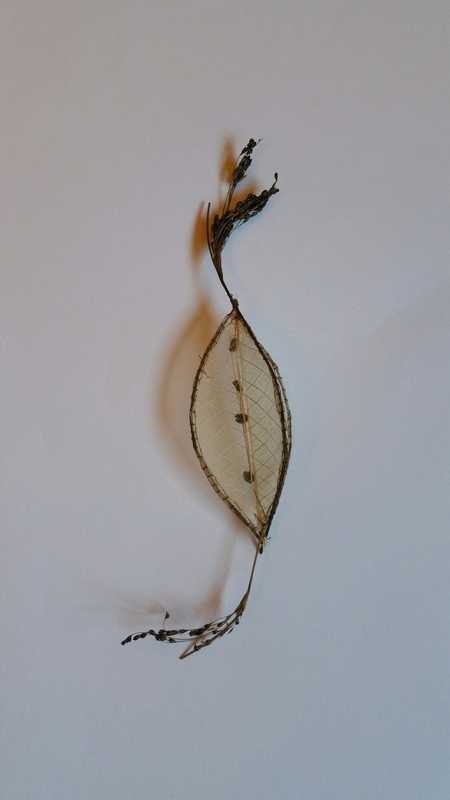 I also wanted to introduce the elongated shape of the woven grass and stick sample from the last sampling stage. I am so pleased with this version. 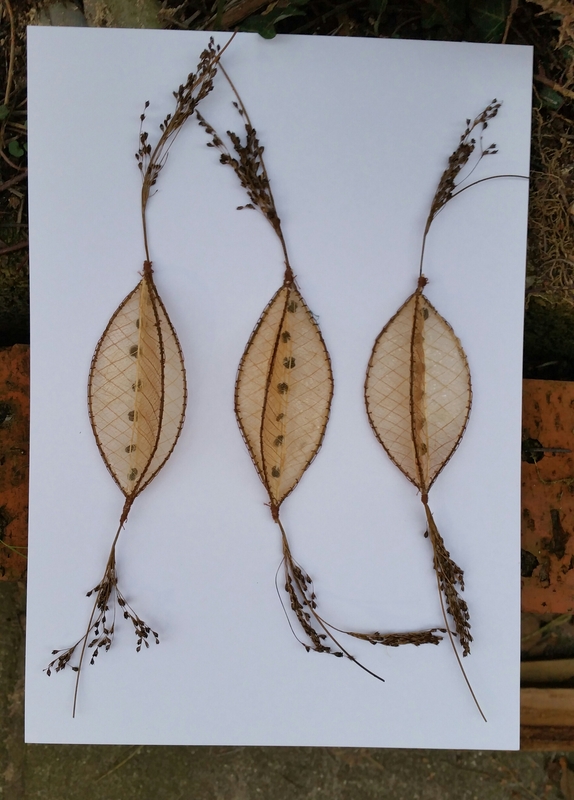 It is an amalgamation of three different samples; the main structure of the plain three leaf seed pod, the elongated wispy shape of the woven twig sample and the movement of the grasses samples. It is very experimental but I love the elegant look it has due to the elongated shape as well as the movement added by using the grass around the edge. 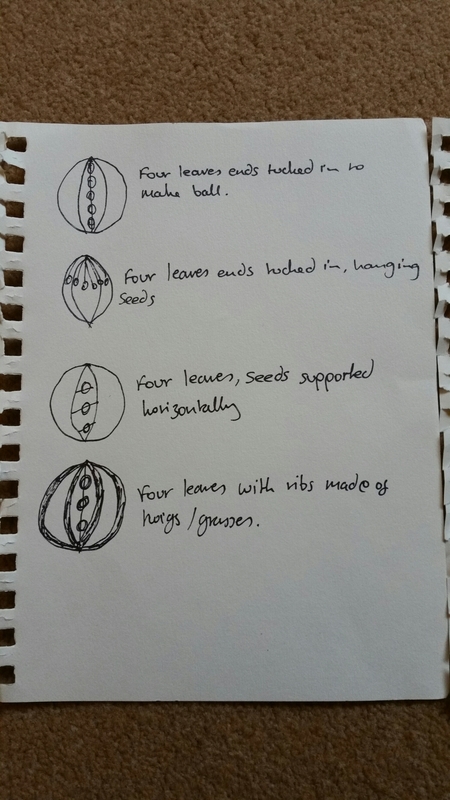 It does make it a more complex structure but does not hinder the view of the seeds within. I am going to use this model to begin my final piece. I am proposing to create a small collection of 3 or 5 pods out of what could be a much larger collection to be hung simply on a plain white background in rows. Other possible methods would be laying on a natural wooden shelf or plinth in a neat line or placing within a acrylic box so they can be seen clearly. I like to see groups of things in odd numbers; to me it always looks balanced. When I visited Alexandra Palace to see ‘Findings’ by Alice Fox I noticed that all her small items were displayed in such neat groups. It is a display technique I particularly like. 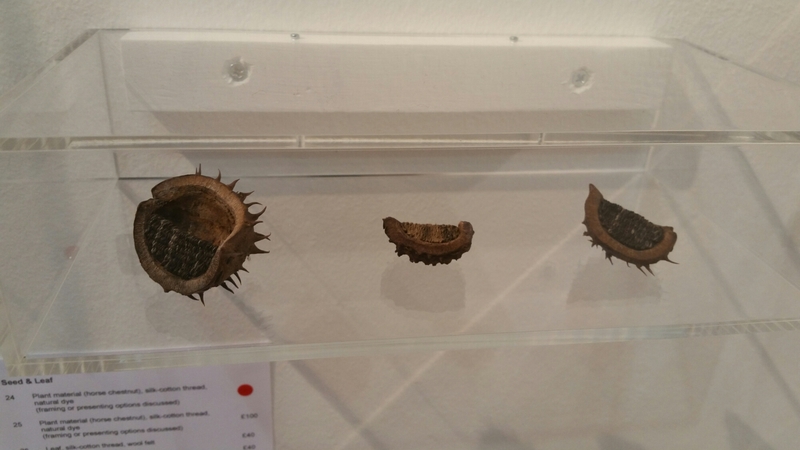 Darned acorns by Alice Fox mounted in a row on a plain white background, covered with an acrylic box to protect them. 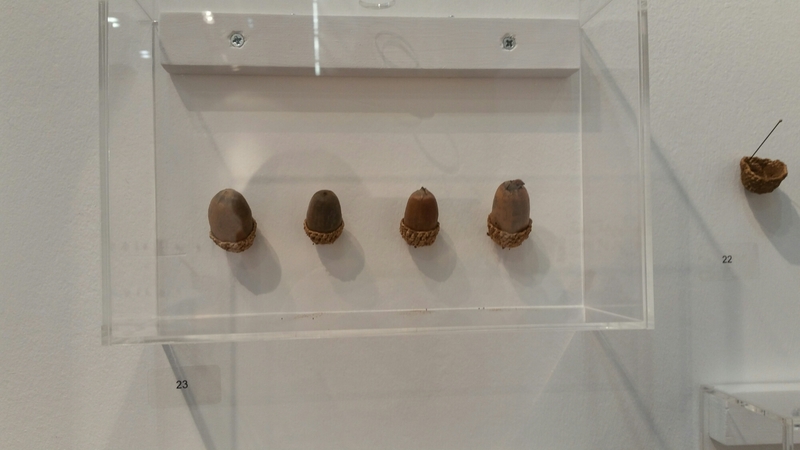 Darned walnut halves by Alice Fox displayed laying on a perspex shelf, again within a perspex box for protection. 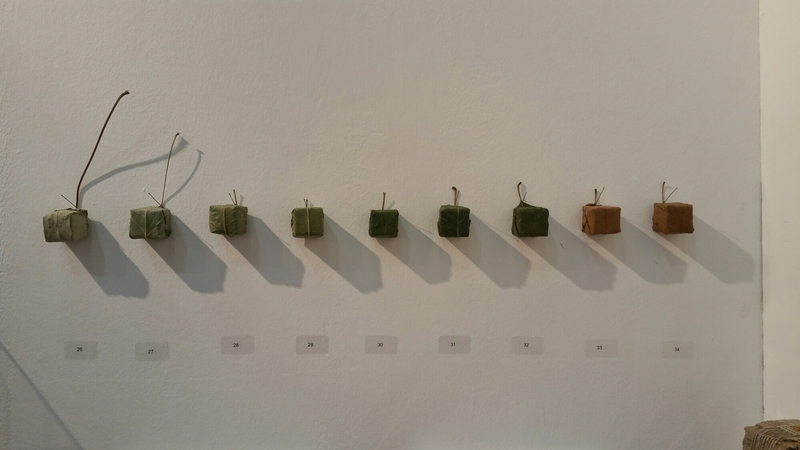 Leaf cubes by Alice Fox; Nine perfectly formed cubes made of leaves in a row. I love this layout and the way the cubes are slightly different but look identical at first glance. This is a style I would like to emulate with my piece. All the pods looking the same from a distance but unique up close.